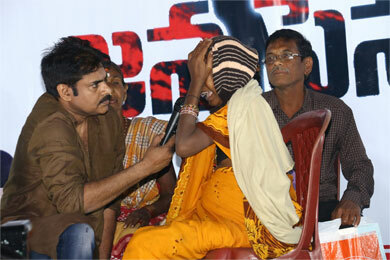 Janasena Party President Mr.Pawan Kalyan visited the affected region & interacted with victims of Chronic Kidney Disease . He assured the victims that he will stand by them till they get proper medical attention and immediate medical relief measures. He announced a core team consisting of doctors, scientists and research scholars on behalf of Janasena Party to address the issue and prepare a detailed report on the current conditions at Uddanam. He set a 48 hours dead-line to the state government to respond on the issue and announce immediate medical relief measures to the kidney victims of Uddanam. He also demanded the government to provide free bus passes and free medicine to patients, rehabilitation of kids orphaned by chronic kidney disease, supply of RO water, establishment of dialysis centres in each mandal, setting up of an research centre to perform multi-factorial research and analysis to find the root cause of the disease and appointment of nephrologists in government hospitals to treat the patients. Government bowed to the demands of people's leader & started acting on fulfilling the demands raised above. Upon Mr.Kalyan's invitation, a group of researchers from Harvard Medical School have visited Uddanam region on 29th July,2017 & has convened a Medical symposium the next day to find a solution to this Chronic Kideny disease. Mr.Kalyan & Party leadership took the Harvard expert doctors to meet with Chief Minister Mr.Chandra Babu Naidu and got the government to fund establishment of World class kidney research center at Uddanam region soon. Thousands of crores are being spent for building the state capital, but nothing is being spent in a region where people are dying.